A reliable GPS can be a great investment if you’re always exploring new areas. Without an up-to-date navigation system, you could find yourself driving down the wrong roads that are too narrow, steep, or have low clearance bridges. You can find many GPS systems on the market including RV-specific units that plan routes based on your vehicle’s measurements. However, shopping for a new GPS system can be difficult when a new version is always just around the corner. Luckily, we found some great advice on a recent iRV2 forum discussion about the best GPS systems currently available. The Garmin RV 770 LMT-S customizes your routes based on the size and weight of your RV. It has a large 6.95-inch, high-resolution touchscreen display and hands-free features like Bluetooth calling. You can also download a free smartphone app to get live traffic information and local weather. On the downside, the Garmin 770 LMT-S does not track time or gas mileage. An easy solution is to plan your trip (and track your information) on RV Trip Wizard and then send your route to your Garmin GPS. Another popular GPS by Garmin is their RV 660 LMT. It has a slightly smaller 6-inch touchscreen display and is also a little bit cheaper. The Garmin RV 660 determines your routes based on the height, weight, length, and width of your RV. With these specifications, the GPS will warn you of low clearance bridges, steep grades, sharp curves, and weight limits. As long as your device is running, the GPS includes free updates so your map information will always be up-to-date. A more affordable option is to download a navigation app like Sygic to a tablet and then mount the tablet to your dash. Sygic is free to download from iTunes and the Google Play store. They also have a free Truck version that plans routes based on your vehicle parameters such as height, weight, and length. The app can be used even when you don’t have WiFi available; an Internet connection is only needed if you want live traffic updates. The app also has useful features like parking suggestions and speed camera warnings. Last but not least you can always count on a Rand McNally GPS. This company has been making navigation systems for years including units specifically designed for RVs. “I loved our old Rand Mcnally 7710. It was retired only due to an unfortunate meeting with our tile floor. 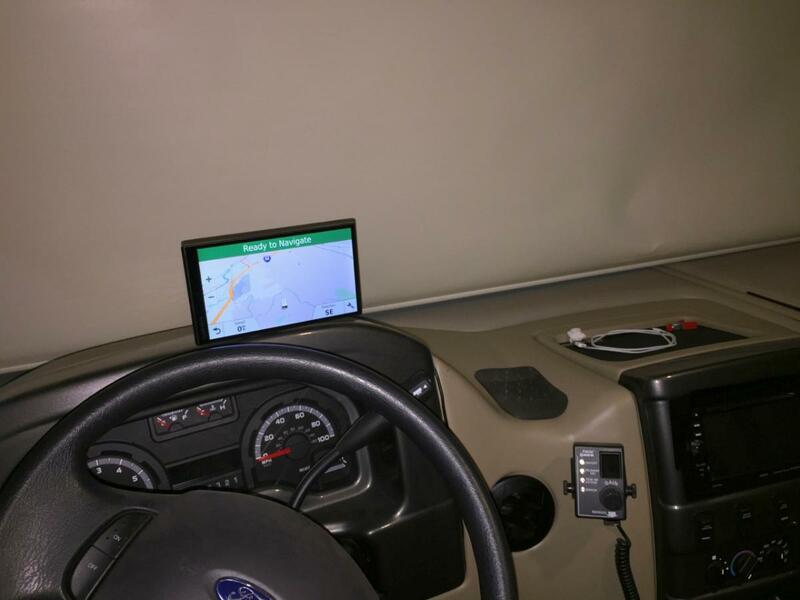 The newest RV GPS units from Rand McNally include the RVND-7, OverDryve, and RV Tablet. They also make large tablets with truck-specific navigation and built-in dash cams. We highly recommend planning out your routes on RV Trip Wizard first. You can find the best campgrounds (with their integrated ratings from Campground Reviews) as well as points of interest like Walmarts and fuel stations, know when to avoid low clearance bridges, and then your entire route can easily be exported to your GPS system. Read more about that here. Has the writer actually taken one of these on the road in a motor home? I was considering one of the RV specific Garmin’s but changed my mind. First, these things are way too expensive. They’re obviously trying to re-capture the value of their intellectual property and development costs. Secondly, the reviews are terrible. Stories about how poor the mapping for large motor homes is very concerning. I’ll just stay on highways and major roads and use my older Garmin and validate what it’s saying with cellular mapping. I don’t know where you’re getting your information, but devices like the Garmin RV 770 LMT-S are actually rated very high (generally 4.5 out of 5 stars on Amazon and the most frequently-recommended system on most RV Facebook groups). Whether or not they’re too expensive is a matter of opinion. They typically include lifetime map updates (not cheap to produce or maintain) and software updates as well. It’s true that there’s not a GPS system around that doesn’t, at times, route you “the long way” or somewhere you don’t expect, but as a default system for RVers, they are better than relying on reading maps in real-time. The only issue I noted with the write-up here (about the 770 LMT-S) is the comment about getting your route with RV Trip Wizard and exporting it to the device. So far, I’ve found no way to do this with the 770 – even using Basecamp software from Garmin. RVTW routing is good, but I would definitely use it as a recommended route and give preference to my dedicated GPS. And even then, it should be eyeballed and questionable areas verified with a motor carrier’s road atlas. I had the Rand McNally from Goodsam and the routing was decent BUT the screen was unreadable if there was any light in the RV. The Garmin 770 has a FANTASTIC screen, excellent bluetooth connection to a phone, but the routing in comparison is TERRIBLE. Google Maps does best BUT does not take into account vehicle size and must have Internet! When the Gamin tells you RV might not be permitted in most federal parks etc you know you have a problem! Also it will decide to return you to go because it cannot reroute BUT doesn’t tell you that is what you are doing! It can take you miles to basically do a U-turn and you have NO idea! Thomas, often I find Google Maps to be only mildly intuitive and oftimes poor. Having said that their maps and directions are superlative. On the downside they don’t allow for height size and weight (maybe they do but I couldn’t find it.. Lack of contrast for roads and background is the only other fault here. Not often known is you can download maps for a trip while online to allow you to use the feature offline. Lack of intuitive design again lets Google down here as its hard to find.. The same can be said for doing something simple like establishing multiple waypoints. You can do it, but its not entirely intuitive nor easy to discern. I agree that a 10″ tablet running G/Maps is less frustrating than a std GPS. I am going to check out the Sygic app shortly. I plan our trip using TV Trip Wizard & then put the same leg in WAZE & away we go! I have the Rand McNally OverDryve 7 RV. It is large, the display is excellent, the GPS works as well as any others. The downside is the customer support. There is next to none. No forums, no real help section or website support. I wanted to add some addtional POIs. The website says to download the Dock software. But the Dock software doesnt work with the OverDryve. I e-mailed customer support, they said “sorry our website is wrong. The Dock software does not work with the OverDryve. We need to fix our website”. That response took three days and they never did tell me how to add POIs. Also I e-mailed about adding the Wireless Backup camera. Three days later I got a response “we dont have a Wireless Backup Camera”. Really? There is one on the website and the OverDryve has an app for a wireless camera. Oh well, next time I’ll buy a Garmin. We are full-time RVers and I love RV Trip Wizard and use it exclusively to plan our trips. My only issue with it is that you can’t export your trip in a form that the Rand Mc Nally RV GPS unit will import. The problem is with Rand McNally’s system….it will only import from the Good Sam trip planner, or from their own TripMaker program…neither of which has anywhere near the features that RV Trip Wizard has. I wish someone would figure out a way to make these two programs interact. My current work around is to export to a .csv file, edit the entires to number them in order so when the address book sorts them automatically they don’t end up mixed up, and then import it into the address book of the Rand McNally GPS. It’s not a perfect solution, but it works better than entering each one individually. You can import BUT it is tedious and probably not worth the effort as another user pointed out. I’m a relatively new RV’er, but the one thing I’d like to see while going thru a metro area is better, and earlier, lane guidance both for advice on which lane to be in, and a warning that the lane I’m currently in is going away soon. Driving in heavy traffic with an RV requires planning ahead, and the TomTom I use is good but could be better with earlier lane guidance. Does anyone recommend a particular GPS unit that is clearly superior in this regard? Thanks! Read the fine print on Sygic. Download may be free but after 14 days, you have to pay. I use the CoPilot RV app. Do far so good. true gps. So keep it on the dashboard so it gets a good signal. The Garmin 770 is wrong about 25% of the time and we usually miss complicated interchanges because guidance is mostly silent when you need it. iPhone and Google navigation is more accurate and actually gives you the turn BEFORE. the street. The height routing is often wrong and directs you way out of your way for no reason if you rely on it. If select a four square based address it is almost always a dead end. I had the sames issues with the Garmin. I bought it for height routing of my 13ft RV. It frequently routed my far out of the way for no reason. I ended not using it at all over time. I have the 770 and it works about as well as most GPS units. If you know where you’re going, avoid any GPS. Invariably, they will take me on a 7 mile ride in a circumvented route when all I have to do is go down on street and follow it. I never knew this, but after talking to Garmin, they DO NOT do mapping. They purchase the intellectual rights from another company and incorporate it into their units. In the 15 years we’ve been using Garmin products, we have had excellent customer service, and the units work well for several years. Then, like planned obsolescence, they die and need replaced. For $400, I believe they are overpriced, but they do work as stated. We use a TomTom. It will eventually just use our smart phones. I used Streets & Trips for decades, but now rely on both CoPilot laptop and CoPilot for my smart phone. We also use WAZE because my lady has unlimited data. Paying a couple of Benjamins for box solutions seems absurd to me when you can get a perfectly adequate navigation system for free or under $20. I have the Garmin 770LMT-2 and have used it on a 2,ooo mile NE swing and recently a 6,000 mile California trip and have never been disappointed. It is a little tedious to set up but once going it is great. Excellent directions with visual and audio directions for which lane to be in for turns. Also gives me time of arrival which is usually to the minute.